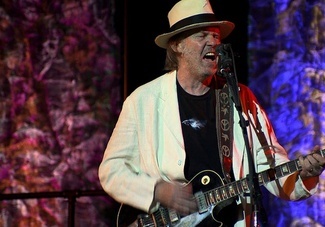 Image from "Neil Young Journeys"
The Slamdance Film Festival announced a long list of special screenings and short films that will play at its 2012 edition. Included in the mix is Jonathan Demme’s “Neil Young Journeys,” a portrait of the rock star at his 2011 summer solo shows in Toronto. The festival will also screen a never-before-seen TV pilot from Ed Wood as part of their program. The Slamdance Film Festival will run from January 20-26 in Park City, Utah. “NEIL YOUNG JOURNEYS”, this is the tracklist to the new movie by Johnathan Demme. Aired at TIFF Canada, 12 September. Also… “Helpless” was played while the end credits were rolling.